While EJOLT partner ERA is busy reporting dozens of environmental injustices in the Niger Delta for our database of conflicts, PlatformLondon just released a shocking report on how Shell funds those that cause many of the human rights violations in the region. 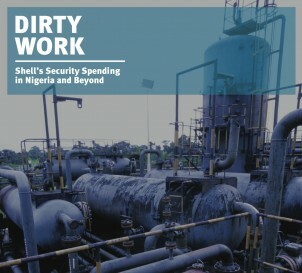 Platform’s Ben Amunwa said: ”Apart from its enormous size, what is striking about Shell’s security spending is how little security it actually created. Shell paid many millions of dollars to government forces with a track record for corruption and creating instability across Nigeria. Shell appear to have spent even larger sums on pacifying militant groups, a practice that has worsened the violence. While primary responsibility for human rights abuses lies with the Nigerian government and other perpetrators, Shell bears a heavy responsibility for the devastating social impacts of its security spending. Hiya, I am really glad I’ve found this information. Nowadays bloggers publish just about gossips and net and this is really irritating. A good website with interesting content, this is what I need. Thank you for keeping this site, I will be visiting it. Do you do newsletters? Can’t find it.